When I came back from diner with friends around midnight, it was nicely clear. So I set the alarm-clock to see if I could catch the NOSS 3-4 duo in morning twilight. Alas, when the alarm clock went off it turned out to be thinly veiled and impossible to observe satellites. So instead I took photographs of the waning moon. The best one is shown below. 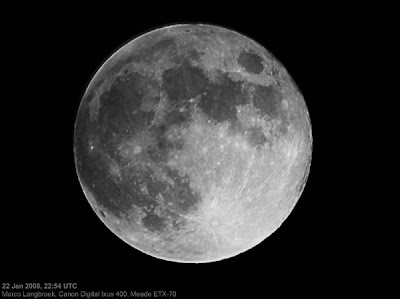 Like a few days ago, this one was made by just holding the Canon Ixus compact camera with its front lens on the eyepiece of the Meade ETX-70. Yesterday the 22nd of January started clear and ended clear, albeit with a near full moon. I did an observing session with the ETX-70 telescope in morning twilight as well as in the evening. The result: positions on the NOSS 3-4 pair (07-027A & C), the NOSS 3-3 pair (05-004A & C) and the NOSS 3-2 pair (03-054A & C), plus stray observations of the ELINT sat USA 32 (88-078A) and the spent Russian rocket Kosmos 1171r (80-026B). I also observed the NOSS 2-2 C & D pair, but couldn't log points (There was only a short time to re-aim the telescope between this pass and the NOSS 3-3 pass, and it then took me just too long to verify I had the correct star field. I saw them pass the FOV but couldn't get to clock them in time.). During the morning session I unintendedly startled one of my neighbours when she came out of her house and saw me on the courtyard with my telescope. She went into a panicky fit as a result. This was just as I was about to catch 07-027A. The resulting melée and the added unexpected appearance of 88-078A as a "stray" only 11 seconds before 07-027A make me suggest to use the 07-027A point with some caution (by the time of 07-027C I should have regained my composure). Some time after the end of the evening session, I portrayed the nearly full Moon. Below image is a quick shot made by simply pressing the (non-removable) objective lens of my Canon Ixus compact on the eyepiece of my ETX-70 telescope. Some after-editing has been done to the image to bring out detail. Yesterday was a very clear day, so in twilight I set up the ETX-70 to gather positional data on Lacrosse 2 (91-017A), the NOSS 3-3 (05-004 A & C) duo and the NOSS 3-4 (07-024A & C) duo. I had adapted the home-made piggyback camera adapter slightly, so it can also funtion as a rest for my 5 mw green laserpointer. 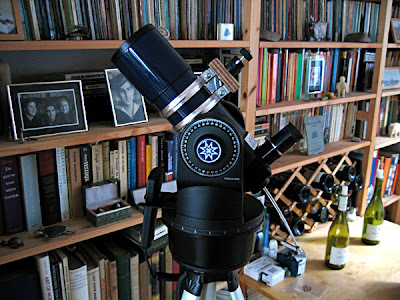 The drawback of the ETX-70 is that it doesn't come with a finderscope, so I use the laser to point the telescope. A 5 mw green laser gives a tens of meters long visible beam at night pointing to where you point the scope if you shine it parallel to the scope tube. Simple, and works like a charm. Unfortunately, after succesfully observing passes of NOSS 3-3 A & C and Lacrosse 2 I must have hit a wrong button on the stopwatch by mistake. When I had pointed the telescope to the point near where NOSS 3-4 A & C should pass and took up the stopwatch, I discovered to my horror that it was no longer running and had no lap times in it's memory! I lost all gathered points so far. Next, in the confusion of having to start up the stopwatch anew just before the NOSS 3-4 duo pass, I lost that pass. What saved the night was that before turning to the telescope, I had triggered the Ixus camera in addition during the Lacrosse 2 (91-017A) pass. The trail showed up faint but well enough defined to measure against the late twilight sky, which meant I had an image providing two positions. 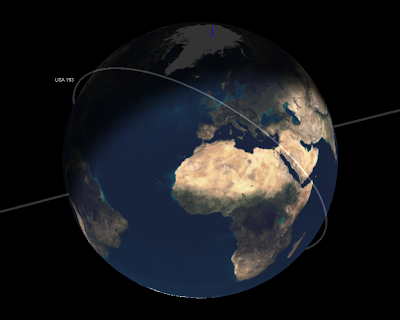 After data reduction, it turned out that the satellite was 17.3 seconds early relative to Mike's 07357.17849791 TLE. On the 6th of January, the difference to this TLE was 1 second. So I reckoned 91-017A must have made a manoeuvre recently. Which, it turns out, it indeed did, a small manoeuvre changing the mean-motion slightly on or near the 6th. What I had missed was that Mike had just issued and update of the 91-017A orbit incorporating the manoeuvre yesterday morning. That 91-017A still does manoeuvre, points out it is still alive and probably still being used for reconnaisance almost 17 years after it was launched. I set my alarm-clock to see if it would still be clear in the morning (allowing me in that event to catch amongst others Progress M-61). But alas, it had become overcast. Yesterday evening the 9th it was clear in twilight, but clouds came in a while later. Nevetheless there was time enough to get out the ETX-70 again and bag the NOSS 3-4 duo (07-027A and 07-027C), the NOSS 3-3 duo (05-004A and 05-004C) and Lacrosse 3 (97-064A). In total, 7 points were obtained. In the morning of the 10th, I observed the International Space Station just before clouds again interfered. About 3 minutes before the NOSS 3-4 duo pass, another faint sat crossed the telescope field in a similar trajectory. I was just making a last check of the star field in view against a plotted map to ensure I had the correct location in view, so hadn't the stopwatch in my hands. At first I was a bit worried it was one of the 07-027 objects but very early, so I was relieved when 3 minutes later the real 07-027A sailed into the FOV. Later that night it cleared again. Below is the image of the ISS I shot a few hours later, during the morning hours. It can be seen passing from Corona borealis into Hercules. It was bright, around mag. -4. My main intended target for that early morning was Progress M-61, but clouds (already visible in the ISS image) intervened. It shortly cleared around twilight this evening. There were flying clouds and some thin high altitude streaks in the sky, but I managed to get a pass of the NOSS 3-4 A and C pair (07-027A, 07-027C) and get two points on each as they passed close to mu Andromeda. Like during my observ ations on the 6th, the sats had a clear yellow colour. This time I had no trouble with handling the stopwatch to retrieve the logged timings any more. Also, comparing with other observer's results, my timings seem good, but I might need to work a bit on the cross-track error. Shortly after the observation cloud cover returned. 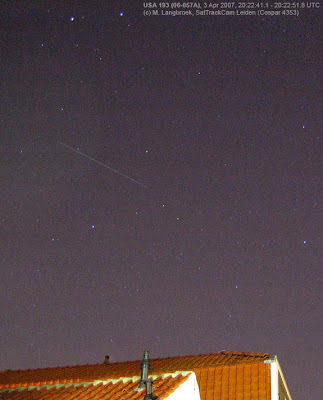 Last two nights (the evenings of 2008 Jan 5 and 6) were the first nights I tried to do visual position determinations on fainter satellites. Targets were the NOSS 3-4 A & C pair (07-027A & 07-027C). The Meade ETX-70 (see picture below), a small and compact 7 cm/f 350 mm (F5) rich-field refractor, turns out to be a very nice instrument for satellite observing. 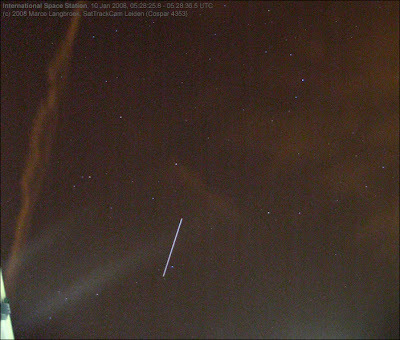 It was cool to see 07-027A sail majestically in and out of the FOV, half a minute later followed by 07-027C. At 14x magnification with the 25 mm eyepiece, the FOV is over 3 degrees with (from the light-polluted mid-town location Cospar 4353 in Leiden center) a limiting magnitude at mag. +9.5. I had some problems operating my (new too) stopwatch though. During the Jan 5 attempt, I pushed a wrong button when I wanted to read out the memory, resulting in the loss of all 4 points. 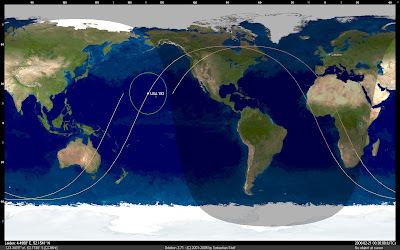 During the Jan 6 attempt, I did the same with 2 points on 07-027A after I had succesfully retrieved 2 points on 07-027C (plus another point on the same object taken during an earlier pass). Evidently, I still need some practise. Logging with the stopwatch, estimating the fraction between two stars crossed, and operating Ted's Obsreduce software all went surprisingly well though. 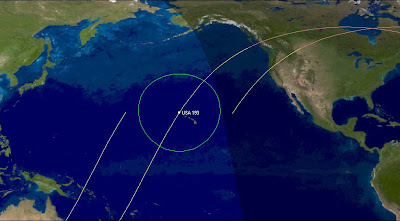 On Jan 5th in deep twilight I observed USA 193 (06-057A) zipping by. I got two camera points on it but apparently the times are off. This failed (?) reco sat keeps being a fine object to view as it is bright and very fast. If it's orbit continues to decay as it does now, the object will end its life around the first week of April. On Jan 6th I observed, apart from the NOSS 3-4 pair, also Lacrosse 2 & 3. 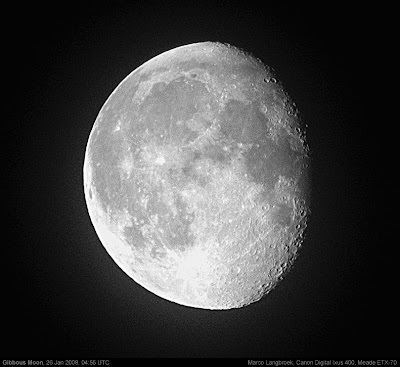 The evening of January 6th was very clear, and I used the ETX-70 to function as guiding mount for the Canon Ixus camera. Target: comet 17P/Holmes. The comet has grown very large (about 1.12 degree currently) and vey diffuse. Below is a photograph showing the comet which is a stack of 39 images of 15 second exposure each. 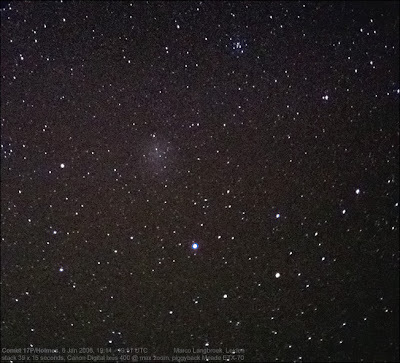 The open cluster in top of the image is M34, the bright star below the comet is Algol. 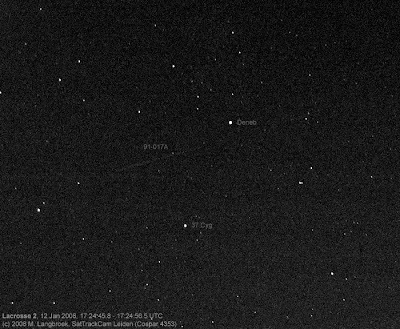 Because the ETX-70 is on an alt-azimuth mount and the comet was near the zenith, where the effect is largest, some field rotation is visible in the stars near the image edges.